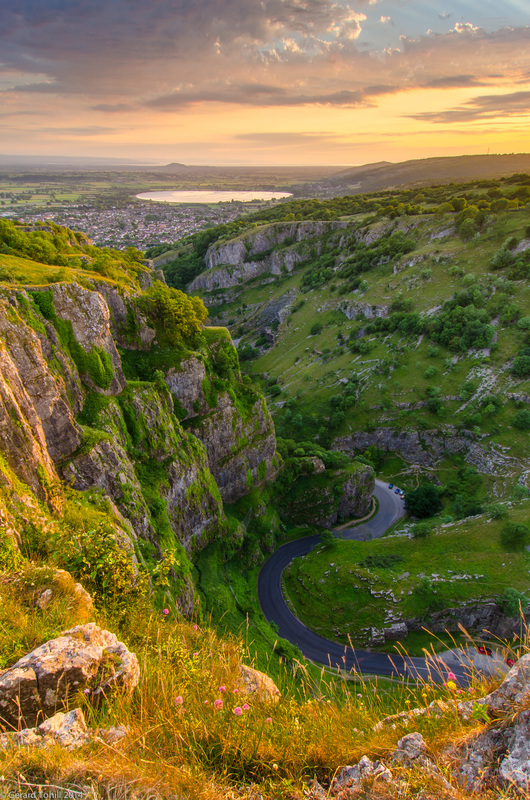 I wanted to capture my version of the iconic view of the ‘S’ bends near the top of Cheddar Gorge. Thus it was that I found myself trudging up the path from Cheddar itself, on the hottest day of the year, full camera bag and tripod in tow. There has to be an easier way of enjoying yourself. To be fair, it’s not a bad walk, as you are in woodland most of the way, so it was relatively cool. The top is a nice place to eat your evening meal, with a cooling breeze and the odd herd of feral goats grazing nearby, as you wait for the sun to go lower and the light to come to you. Warning: The cliffs in the gorge are very steep and high. If you do go up here, be very careful near the edge. For those interested in the geography, Cheddar itself is just below and to the left of the large reservoir visible top centre. The Mendip hills stretch out towards the right of the frame. The lonely bump just left of centre on the horizon is Brent Knoll, with the Bristol Channel behind it. Photography stuff: 12-24mm lens at 12mm, 1/2 sec at f/13, 3 stop hard graduated ND filter to hold back the sky (and to allow me a long enough shutter speed to capture detail in the gorge which was in deep shadow), tripod (securely anchored! ), cable release, nerves of steel. Pretty as a painting, with a Pre-Raphaelite feel to it. Nice. Thank you – the light was very good that evening, and it makes my job so much easier. Very nice and glad you survived. Also, thank you for the camera setting details. I’m moving closer to purchasing and using a series of ND filters. Any suggestions on brands and educational material? I tried the smaller Cokin filters a few years back, but I no longer use them. I now use the excellent Lee filters. They are expensive, I’ll admit, however they do exactly what I want. I’ve not tried other brands, so I cannot comment on them. As for educational stuff – the Lee videos themselves (available on youtube) are quite informative, plus I have subscribed to a free email that Lee produce – it quite handily breaks down images and shows how the filters were used in that image – again, very useful. Thank you, I’ll look into both. Is the light really that magnificent! That grass in the foreground is wonderful. Yes – the light did me proud that evening. It lit up the foreground magnificently, as well as giving nice contrast to the cliffs. Great when a plan comes together – it doesn’t always happen. This is so pretty! Wonderful composition.